Sri Lanka is a country of many hidden talents, one of them being its thriving business ecosystem which has seen the rise of dozens of successful startups. As a startup with operations in Sri Lanka, we wanted to introduce you to some of the other exciting businesses that have been created in the region in the last few years. To celebrate the inauguration of our Entrepreneurship Series, we wanted a company that, like us, was operating in the Sri Lankan travel industry. What better choice than Trekurious, a company that started curated experiential tours and activities in Sri Lanka and has since expanded to India. We talked to Rukmankan Sivaloganathan, CEO and Co-founder of Trekurious, about his business, his vision, and his goals for the future. Trekurious is an incredible marketplace for travellers looking for unique experiences, how did you get the idea or concept to start your business? The company started out as a travel focused business, even though it has evolved into something different since. The concept first came to me when I was noticing large groups of business school students on graduation trips in Sri Lanka and realized that Sri Lanka was lacking in experiential tours and activities and there was a need to be filled. I had this concept in mind, yet I wasn’t sure how to model it up. Then, I went on holiday in Vietnam and we were visiting My Son when our tour guide fell sick. The tour company then hired an archeologist who was digging on the site to be our guide and that was the Eureka moment! In that moment I knew ‘this is how we do it’, we match up experts with people who want an experience. With that idea in mind, I was still unsure of the model until I met my co-founder who suggested a marketplace model, and that’s how Trekurious was started. That’s how the name came to be as well – it was supposed to be experiential treks for the curious. We started with this idea but pretty quickly we expanded and broadened our scope to lifestyle, food, family. Funnily enough, now we are moving away from travel and exclusively into food. Some of the people who offer experiences on your site are quite famous, especially in the food category, for example your Sri Lankan Masterclass with Chef Koluu. How did you get these people to partner with you? Like all things, it was tough at first. However, once we started the site and we became established in the market, we would approach all these chefs and they seemed keen. It’s as interesting for them as it is for us – a lot of high end chefs are looking to build up their own brand, and they liked the idea of broadening their own database and getting added exposure for themselves, so they were quite keen to work with us and do some interesting dinners in Sri Lanka and Mumbai. Did you start your business in Sri Lanka? Yes, and now we’re operational in Mumbai as well. Why did you choose Mumbai as your second destination? India was always planned as the second destination – it’s a tough market so the idea was that if we could crack India, we could go anywhere. 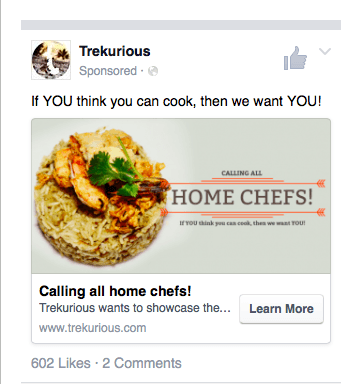 We have plans to be global so we want to expand Trekurious to Singapore, Dubai, and other major hubs. India was always going to be your second destination but how did you decide on Sri Lanka as your first? How have your goals evolved over time? You say today that you want to be global, did you have that in mind when you first started the business? The goal was to be an experiential travel provider across Asia, and then it evolved into us democratizing access to great travel, experiences, and food. If you are a Trekurious customer in Singapore and you travel to Hong Kong and Mumbai, even though you are curious and ready to explore, you might not have everything you need to experience both cities, but because we’re there and you know us, you can get that access thanks to our site and the services we offer. So that was, and still is, the goal to this day, except now we want to focus purely on food. We are going to launch an app and go mobile soon, so the idea is that, whichever city you’re in, you go and open up the app and immediately find what’s happening that day in terms of food experiences, masterclasses, home cooked meals, wine maker dinners, etc. So your business runs on a relationship based on trust? Yes, we are also moving down the value chain, working on new products that will give you access to daily curated meals that are only available that day, stuff like that. So the relationship part is very important to the brand building but for your business to work you have to do regular reputable stuff. Do you think your company grows through word-of-mouth? We do actually – it’s food right, and that’s the great thing about food, people will always talk about good food. Travel is a bit more complicated because it is A to B for a certain amount of money, you also have to convince your friends to go to the same destination, and you have a set type of requirements. It’s more of a process, but food is food. Everyone loves food, and it’s much easier to promote through word of mouth. Do you have many people contacting you independently saying ‘we have this service, we’d love to offer it on your site’? Yes, we do. We had a campaign on social media where we asked home chefs to contact us if they thought they had a service worth showcasing on our website and we had a huge response – in 2 days we had around 40 people writing in from Mumbai and 20 people from Colombo who wanted to be home chefs. These are individuals like you and me who can cook very good food and who are open to hosting people at home. That’s been one of the surprise discoveries of us being at the forefront of the food landscape in Mumbai, and we’re trying to kickstart this in Sri Lanka. So these people who contacted you became ‘experiences’ on Trekurious? Before they get featured on our site, we put them through a very thorough curation process. That’s our USP (Unique Selling Point) – everything we have on our website is something we have tested out. That’s really what sets us apart, we’re not a pure player connecting products with customers like a marketplace, we have an intense 4 step vetting process – we do a full interview, then a home visit, a tasting trial, and finally a focus group trial to see how our potential customers will respond. And we do all this before we put them online. For example, right now in Mumbai we have this amazing home chef who does ramen noodles, and they’re absolutely delicious. The idea is to then link all this – the chef, the curation process, the experience – back together in our app. In terms of starting your business, do you think your intimate knowledge of Sri Lanka helped you as it helped us when we first launched in Bali? Yes, absolutely, and that’s why we launched there. Our connections and networks were stronger in Sri Lanka so it was easier to start off there. What were your biggest challenges, if any, with operating in Sri Lanka? The biggest challenge was raising money. Thankfully, we were lucky that around the time we started looking at starting our company, the whole angel investment ecosystem was being kickstarted in Sri Lanka by Blue Ocean Ventures. They started Sri Lanka’s first angel investing group, the Lankan Angel Network, and launched it with a startup competition called Venture Engine. We took part, came third, and got funded. Sri Lanka proved to have some tough challenges as well – finding people to work for a startup was hard. We were lucky, we found some good people, and it’s getting better now, but when we first started it was definitely one of our biggest hurdles. In general, the toughest challenge is always getting people on board – in terms of partners, of employees, of people funding your business, etc. What do you think of the business ecosystem in Sri Lanka for people who want to start their own businesses? It’s actually quite easy. Relative to India or other countries in the region, it’s very easy to start a business and there isn’t too much regulation. There are minimum business earning regulations that you have to adhere to, some industries are more complicated than others so there are these regulations, but the startup ecosystem is very easy and that’s one of the reasons we chose to open Trekurious there. Do you think we’ll see more and more businesses opening in Sri Lanka as opposed to established business hubs such as Singapore or Hong Kong? Absolutely. There has been a lot of change in the last few years. As I said, when we first started it was a little tougher and the market wasn’t quite as established, but in the last few years we’ve seen many startups pop up in Sri Lanka and be successful. From real estate and job portals to huge e-commerce sites, you can find quite lots of interesting startups in the country now. What do you think a company needs to succeed today in Sri Lanka, or in general? I know this sounds really cliche, but ultimately it comes down to good people. You can have a good product, but without the adequate support system in the form of your employees, you won’t get very far. Then, you need the right funding, and finally you have to have be focused! To find out more about this innovative startup, or to book your experiential tour in Sri Lanka or Mumbai, visit Trekurious.